Have you ever had a taste set off a particular memory? 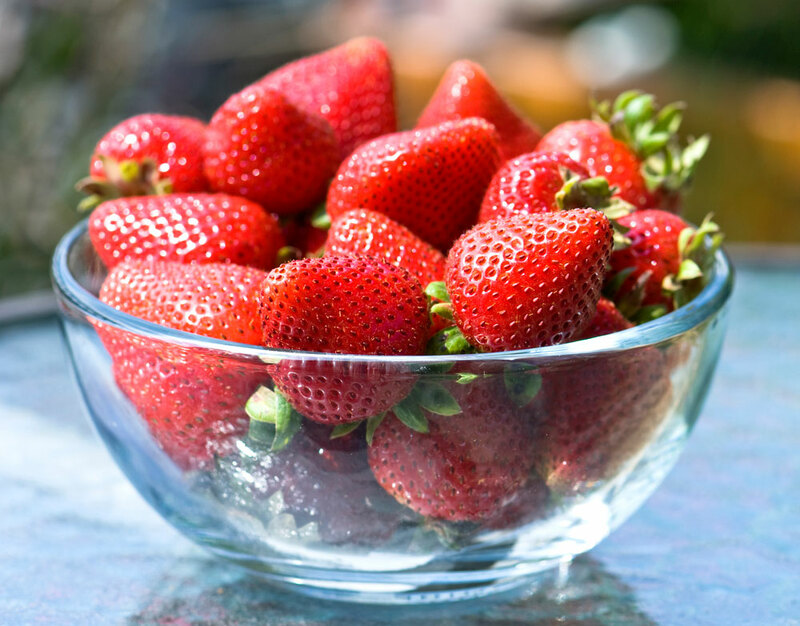 For me, one of the most evocative tastes is that first bite of a field-ripened strawberry—it instantly and powerfully takes me back in time to when I was a little girl of just five, staying with my paternal grandmother. My grandmother lived alone in a small house on a quiet street of a sleepy prairie hamlet about an hour’s drive from my childhood home. Because of the distance, I didn’t get to see her as often as I would have liked to. She was an easy going, warm and loving woman with a ready smile and a calm, soothing nature. She adored children and I loved being with her. So when she asked if I would like to come stay with her for a few days, I was keen to go, even though I was very young and had never been away from my home or parents before. I arrived at my grandmother’s house in early summer. The weather was idyllic, her gardens were abundantly bursting forth and I couldn’t have been happier to be spending time with her. While my grandmother had asked for and desired my company, she did not alter her regular routine and went about her work and daily chores as always, and, as was the custom of the day, I was expected to entertain myself. This suited me just fine—I was more than happy to while away those hours all by myself. In those days, most rural folk planted and tended large vegetable gardens and my grandmother’s vegetable garden was extraordinarily large. Roaming about barefoot in the warm summer sun and exploring her vast vegetable garden was, to me, high adventure. I properly introduced myself to all the burgeoning and seemingly endless rows of vegetables and got acquainted with all the other residents of the garden—the ladybugs, fuzzy caterpillars, dragonflies and the myriad of red poppies which dotted the garden. They all befriended me. The vegetable patch was a never-ending source of delightful exploration and endless fodder for my playful and active imagination. But what intrigued me most at my grandmother’s house was her large and luscious strawberry patch. 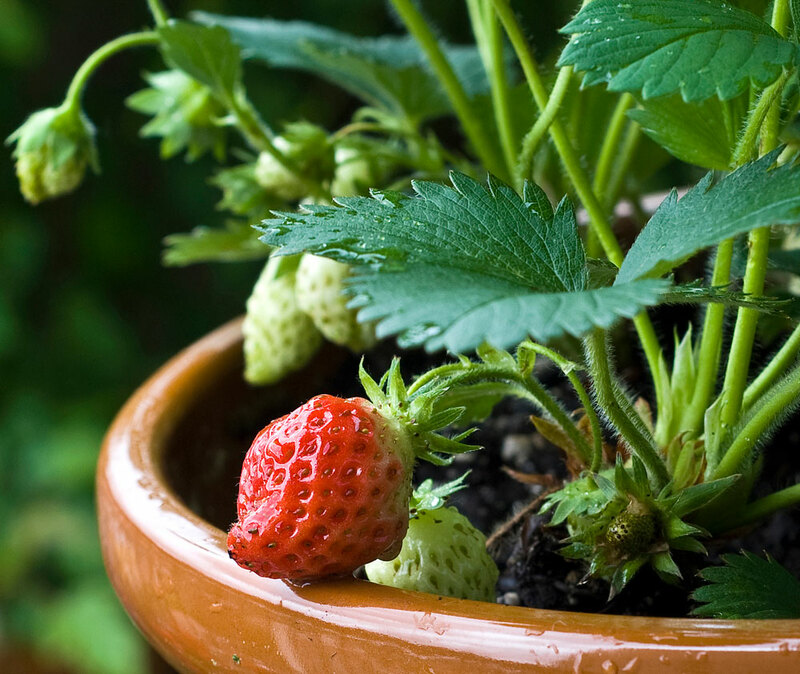 While my mother also grew a large vegetable garden, she never grew strawberries, one of my favorite berries. So I was especially excited on that visit to discover that my grandmother had a huge strawberry patch happily thriving at the side of her house in the southwest corner of her yard. I was in Strawberry Heaven! 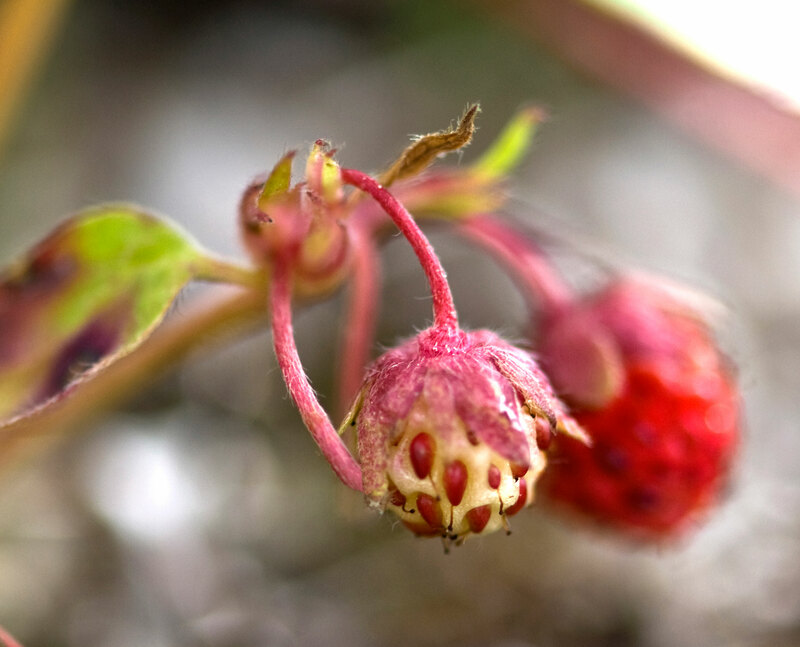 My grandmother’s strawberry patch was the largest strawberry patch I’d ever seen and I eagerly (but ever so gingerly—so as to not tread on any plants) padded about, gently lifting strawberry leaves in search of the precious little red jewels. With each berry I uncovered, my heart leapt for joy. I wasted no time in plucking and tossing each sweet berry directly into my open mouth. 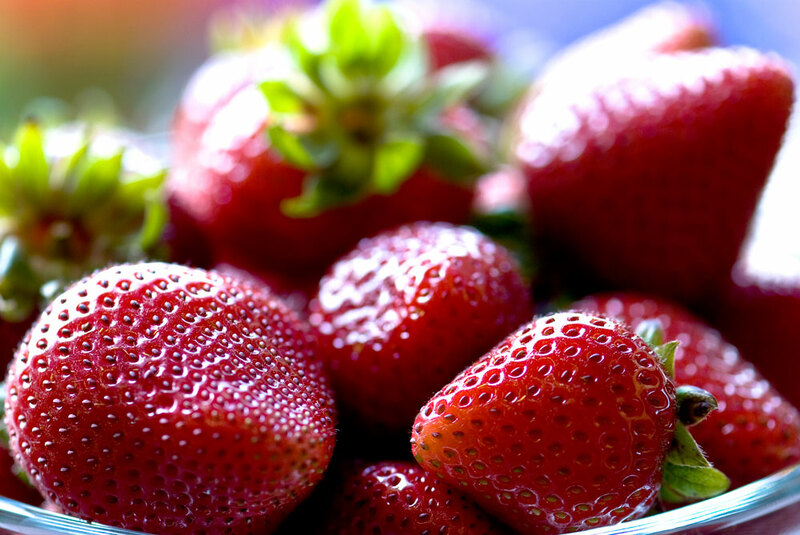 Oh, the unforgettable burst of strawberry flavor—there was nothing else that tasted like a strawberry—it was like a pop of red summer sunshine wrapped up in a sweet and tart juicy red heart. I recall it as clearly as if it were today: standing in that strawberry patch, the sky a flawless azure blue, the summer sun pleasantly warming my bare-skinned arms and legs and the warm feel of the soft, moist earth yielding under my bare feet. There was simply nowhere on earth I would rather have been. The second day of wanderings in my grandmother’s yard ended, once again, in the strawberry patch. Basking in another beautiful summer’s day, I reveled in scouring the patch, harvesting it’s tasty, precious red gems. I methodically moved about, peeking under the leaves of each strawberry plant, very much enjoying the hunt, when, much to my surprise, I lifted a strawberry leaf and unearthed a pure milk chocolate bar! What was this? I looked around and saw no one. I picked up the bar. It was cool to the touch and looked brand new. I unwrapped the bar, took a moment to admire it’s smooth, unblemished perfection and ate it on the spot, as if it were the most natural thing in the world to find a chocolate bar under a strawberry leaf. That was my first ever culinary experience of pairing strawberries with chocolate—if Heaven could be improved upon, this was it! On the third day of my visit to the strawberry patch, I found another cool, fresh chocolate bar. I looked around once more, wondering who could be leaving these chocolate bars in my grandmother’s strawberry patch. This time, I noticed my grandmother’s neighbor looking through the glass window of the side door to his house—a kindly-looking old gentleman with snow-white hair, an old fashioned mustache and twinkling eyes. He smiled warmly, nodded his head and eagerly motioned with his hands, that, yes, I was to take the chocolate bar—it was for me. Everyday of my visit thereafter, I discovered another fresh bar of pure milk chocolate hidden under a strawberry leaf somewhere in the patch. And, each time I discovered it, the gentleman next door smiled warmly from behind his window and waved at me in approval as I found it. 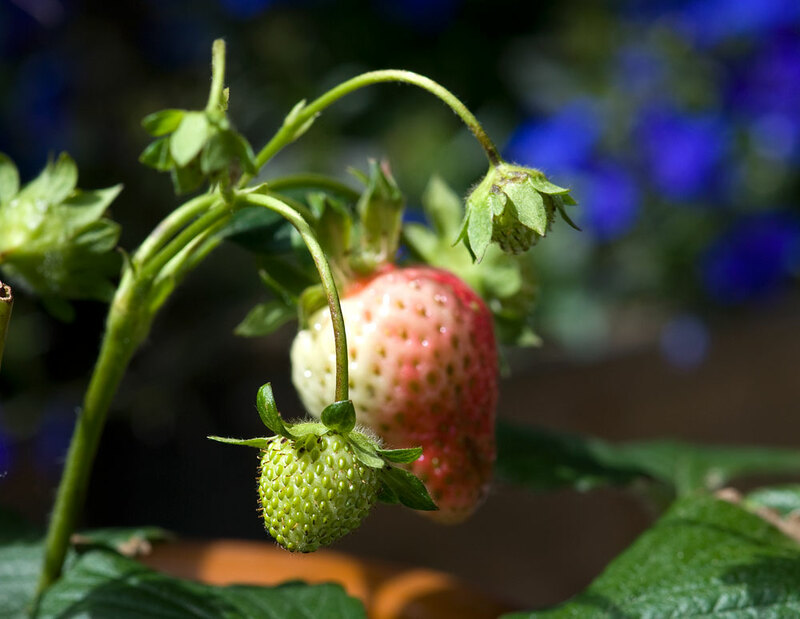 We were never formally introduced, nor did we ever exchange a word, yet we shared moments of pure delight, which, to this day, are powerfully evoked in that first bite of each new season’s first fresh strawberries. I didn’t immediately tell my grandmother about these magically appearing strawberry patch chocolate bars, but when I finally did, just before I left to return home, she laughed heartily, and told me that she didn’t have a strawberry patch at all—the magical strawberry patch I’d been pilfering strawberries from belonged to the lovely gentleman who lived next door! What a great story Jeannie! Strawberries were my favorite as a kid. I wish I found a chocolate bar in my aunt’s strawberry patch. Just magical!! Wonderful story and the photography is first rate, as always. Yum! Jeannie, what another beautiful post! And oh, how it makes me long for strawberries! I’m in northern Michigan where they’re now in season, and I can tell you that after reading this sumptuous post tomorrow I’m going out and buying some fresh strawberries. And yes, as you say, the wunderbar taste of strawberries brings back fond memories of my mother — we used to go out and pick them together, and she and I made an easy strawberry jam I can even now taste in my memory. Thanks again, Jeannie, for writing this post! Wonderful indeed!!! Oh, oh, how heavenly. And I love the expression Strawberry Moon. Your grandmother sounds like a wonderful person. Thank you for sharing some of these special moments with us, and your ‘delicious’ photographs too! What a magical story, loved it. You should write a book, or have you already? Strawberries and dark chocolate for me :) Beautiful photos as always! I wish you a beautiful sunny Sunday. Great story, Jeannie… I will write again on my blog later this summer. I want to enjoy this wonderful time of the year and I hope you do the same. Great share, thanks! 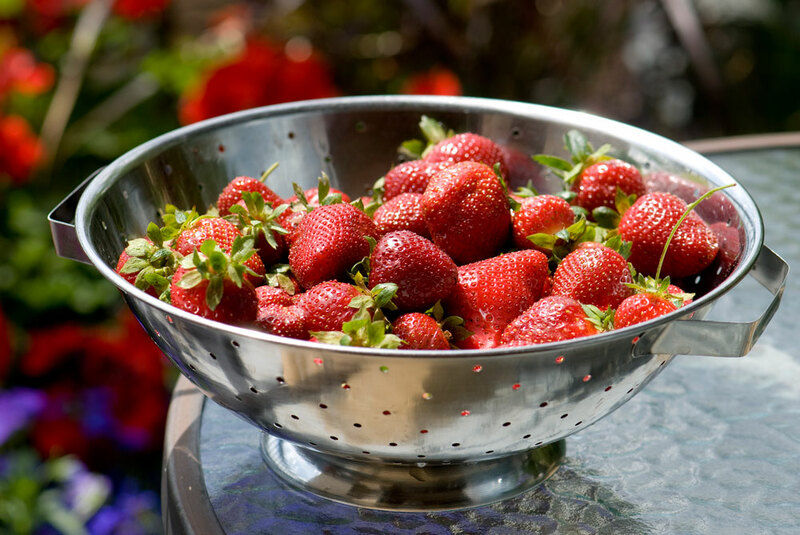 The kindness of the neighbor is as beautiful and delicious as the ripe strawberries. What a beautiful story and such a delicious memory. I just came across your blog… and I am thoroughly enjoying it! Thank Ya, Ma’am! Love your blog!